Transform an ordinary outdoor area into space that adds value and comfort to your home. 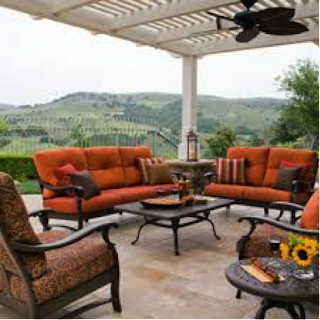 The backbone of every outdoor room is the furniture. Think about how you will use the space and choose furniture that best fits your needs. Will you primarily use the space for lounging and reading a book? Enjoying your morning coffee and newspaper? The options, styles and colors of patio furniture that are now available are abundant. Bring the luxury of an indoor room outside by adding an outdoor rug. It will not only add comfort, but also color and style to your space. Another inside-the-house luxury must-have coming outside are textiles. Throw pillows crafted from all-weather fabric and cushions are an essential part of creating a cozy space. Extend the life of your outdoor room into the evening hours by adding lighting. Candles (real or electric), solar lights and electric hanging lights are great options and create ambiance. Chances are your outdoor space will be near your landscape, but consider bringing potted plants into your “room.” Plants add color while adding to your room’s coziness factor. Depending on the amount and size, plants can also be helpful in noise reduction. Vitamin D is great, but too much sun isn’t. Remember to add shade to your space with natural elements such as trees, hanging vines and larger plants, or with structures such as pergolas, trellises or umbrellas. If your patio is south facing, consider adding a roof or a sun sail for maximum coverage. Just like an interior space, color plays a huge role in determining style. Cushions, pillows, rugs, accessories and plants should be part of the color palette that you create. Sitting around a fire is a backyard staple. Instead of building a fire pit, consider buying a stand-along fire pit or a fire pit table. Another great way to add ambiance and reduce background noise is to add a water feature. Whether it is a waterfall or a trickling tabletop fountain, nothing beats the sound of water for relaxing. Even if the main purpose of your room isn’t for eating, having a place to set down your drink is a must. Add side tables to your space or a stylish serving tray to your ottoman. Integrating elements that provide privacy to your outdoor space adds to that “room” feeling. Instead of walls, think curtains, climbing vines, hanging baskets, and shrubs.